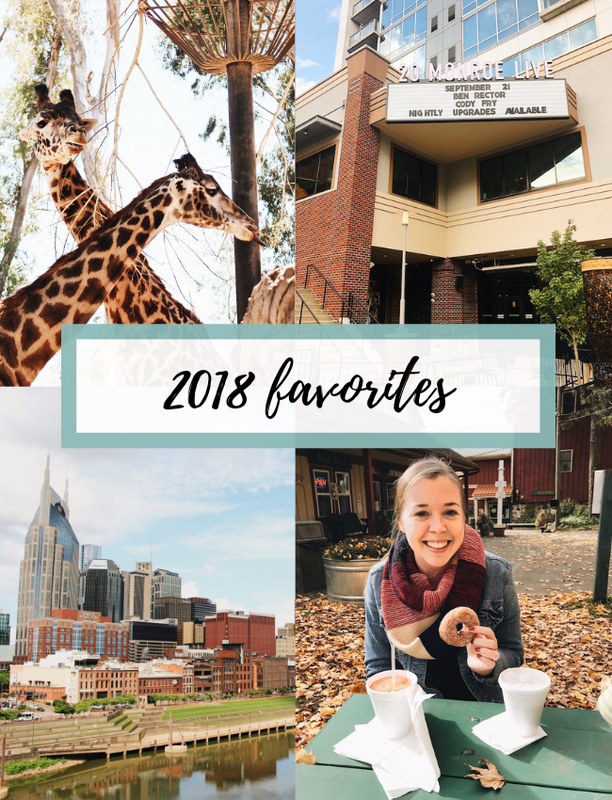 2018 has been a big year in many ways, and I am excited to share some of my favorites from this year in today’s post! This summer I was able to travel to Nashville and San Diego for the first time! They were both such fun trips, and I did posts highlighting them as well. Checkout my guide to 48 hours in Nashville here and San Diego part 1 and part 2! This fall I was able to go to a JohnnySwim concert and a Ben Rector concert. I had never seen Johnnyswim and only knew a few of their songs, but they put on such a great show. Then I saw Ben Rector, who I have seen once before and love! Always a good time at his shows. Last fall I was officially accepted into grad school and this fall I officially started! Going along with this, a high of my year was getting my own clients this fall and gaining so much knowledge and experience in just one semester. This fall I moved off campus for the first time in college, and I have LOVED living off campus. Even though my apartment last year was on the edge of campus, it still was on campus and just wasn’t as nice as the house I am living in this year. I love my house and housemates this year, and I just signed my house for next year as well! It is the cutest house and I am excited to live with three different girls. Last fall I decided to take advantage of free time and do things that I enjoy and that will hopefully help me in the long run. Whether it is working out, journaling, reading, etc. I have intentionally taken more time this year to improve myself. I wrote a whole post about it last spring, so read more here! Besides a blip at the beginning of January, I have posted at least once a week this entire year. Posting once a week might seem like not much to some people, but I am so proud I was able to keep this up even as I started grad school. This goes along with my #5, because I have prioritized this more this year since I know blogging brings me joy and gives me a good creative outlet. I also posted every single day in July since it was on my 101 in 1001 list and it challenged me to get really creative! If you talk to me in person, you probably have heard me complain about Michigan. It isn’t a place I see myself living long term, mainly because of the long and snowy winters. But this year I have been trying to appreciate it more now that I know I will probably only be living here another year and a half. It really is nice during the summer and fall, and Grand Rapids is a great city with plenty of good restaurants and coffee shops. In 2018 I tried quite a few new places and I finally made it to Holland after a few years! What was your favorite thing about 2018? Let me know in the comments!